Pathogens that cause plant diseases can move in mysterious ways. Last year, holiday wreaths that contained boxwood twigs and leaves, as part of the decorations, were contaminated with the pathogen that causes boxwood blight and inadvertently sold to consumers. Boxwoods in the Midwest and Great Plains can suffer from multiple diseases and abiotic (disorders) problems. Often, due to low temperatures and open winters with little snow, boxwoods in the landscape become prone to injury and other root and foliar diseases. This holiday season, we invite you to inspect Christmas wreaths for symptoms of diseases and signs (i.e., evidence) of disease-causing organisms before you buy them. Once you get your wreath home, avoid hanging it near boxwood shrubs or pachysandra (spurge) in your yard. The boxwood blight fungus can easily move from contaminated wreaths to healthy plants. If you suspect your holiday wreath is contaminated with Boxwood blight get in touch with your local plant clinic. In Iowa, contact us the Plant and Insect Diagnostic Clinic. Visit the National Plant diagnostic network Clinic at the site NPDN, scroll to the map and click on your state. Finally and most importantly, when disposing of your holiday wreaths, burn them (if your locality allows) or place them in plastic bags and put them in the trash. DO NOT compost your wreaths. For more information on boxwood blight, please see the article “Boxwood Lovers: Beware of the Blight”, publication BP-203-W “Boxwood Blight or the Virginia Tech Boxwood Blight Task Force site. 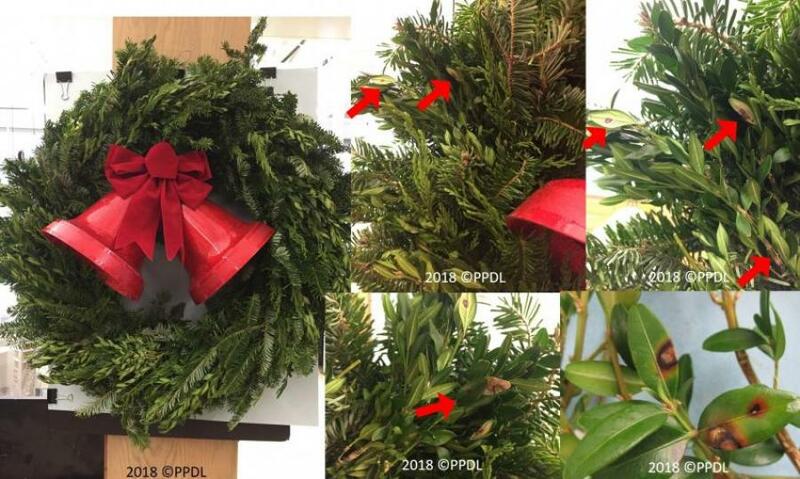 To learn more about last year’s problem with boxwood blight in wreaths, see the Purdue PPDL article “Boxwood Blight on Holiday Greenery” and this holiday season recent report in Michigan "Have a closer look at your boxwood wreaths this holiday season"
Special thanks to Tom Creswell and Gail Ruhl from the Purdue Plant and Pest Diagnostic Lab (PPDL) and Brian Hudelson from the Plant Disease Diagnostics Clinic University of Wisconsin-Madison (all members of the national Plant Diagnostic network-NPDN, and the north central region –NCPDN) for editing this article and providing images. Links to this article are strongly encouraged, and this article may be republished without further permission if published as written and if credit is given to the author, Horticulture and Home Pest News, and Iowa State University Extension and Outreach. If this article is to be used in any other manner, permission from the author is required. This article was originally published on December 14, 2018. The information contained within may not be the most current and accurate depending on when it is accessed.